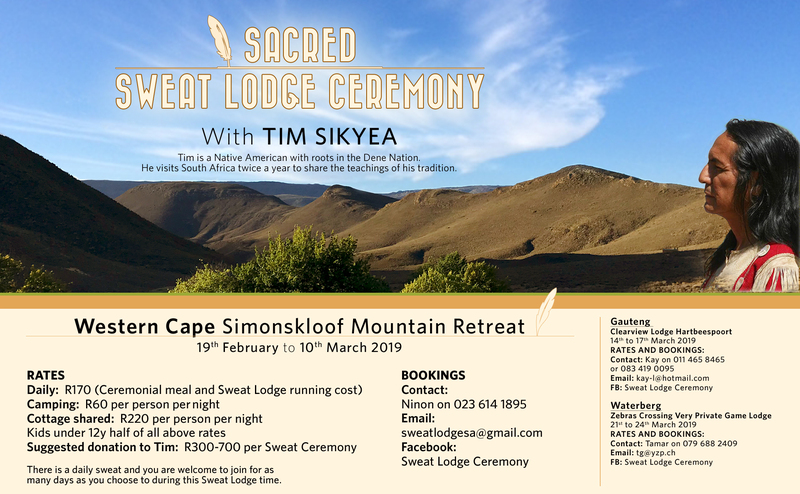 Twice a year Simonskloof Mountain Retreat is host of a Sacred Sweat Lodge Ceremony lead by Native North American – Tim Sikyea. March and September are the months when we gather for up to 12 days (or even longer) of Sweat Lodge Ceremony to give thanks to Mother Earth, give gratitude for what she provides unconditionally. It is a purification ceremony to heal ourselves and remembering how fortunate and blessed we are. You are invited to join in this Sacred Ceremony and choose as many sweats you feel you want to take part in. Sweats are by donation – let your heart guide you.